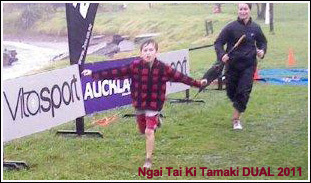 Ngai Tai Ki Tamaki participants competing in the DUAL Event 2011 held on Rangitoto and Motutapu islands. The Dual Event 2011 was held on Rangitoto and Motutapu Island. The DUAL offered mountain biking and running/walking options.The scenery as expected is breath taking. The day was slightly overcast but Ngai Tai represented the best way we know how by participating. The second of our family fun days started with a Karakia and a mihi with some words of encouragement by our own Kaitiaki unit member and participant Jeff Lee. It was then into the action with both Jeff and John Clarken Snr capturing the DOC rat both winning spot prizes. John Clarken Snr also finished 14th overall, a big effort from one of our staunch supporters and only 8 minutes from the eventual winner. Also of mention is Latham Lee who at the age of 7 completed the 10k run with his Aunty Jo. KA MAU TE WEHI TAMARIKI !!! These whanau fun days promote a positive attitude, good health and the importance of being active. Through these fun days we can re-connect with whanau members who we may not have seen for a while and re-invigorate our whanaungatanga. Special thanks always goes to those that help co-ordinate delegate and initiate these events!! SEE YOU AT THE NEXT WHANAU FUN DAY "KING OF THE MOUNTAIN"